Children love to sing, to clap, to move their bodies. Sing Your Way Through Phonics allows children to strengthen their phonics skills in a way that is natural and fun. Your class will hardly realize they are practicing the vital decoding skills that help them become independent readers. From letter identification through spelling patterns and phonic rules, Sing Your Way Through Phonics is the snappy alternative to skill and drill. Use our examples or substitute your own. Each phonics song is recorded in both vocal and instrumental form. Once students become familiar with the words, concepts, and melodies in the vocal recording, they can move on to the instrumental recording, substituting their own examples for each phonics rule. 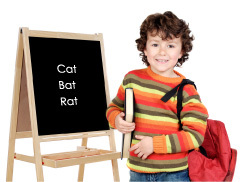 For example, in the song “Spelling Families,” (Volume 1), students can substitute the words hat, pat, and sat for the original words--cat, bat, and rat. Children enjoy the challenge of dividing up the songs into sections, singing in question-and-answer format, and assigning different groups to sing each section of the lyrics. When hand and body motions or rhythm instruments are added, learning is further enhanced because students are involving their whole bodies in the learning process. Use our visuals or create your own! Sing Your Way Through Phonics CDs are designed for use with Mini-Charts which provide a visual link to print while singing. Mini-Chart booklets include over 100 pages of song-coordinated examples, including reproducible templates for customizing each song to match students’ vocabulary and interests. 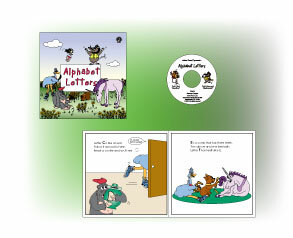 Alternative examples for each song are included in Teaching Suggestions Booklets included with each CD. 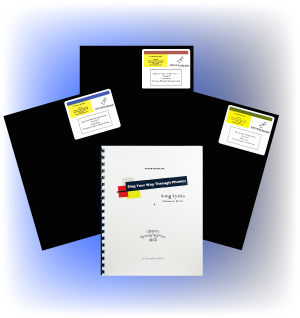 Save time and expense with our CD/Mini-Chart/Lyrics Combos and Ensembles. Sing Your Way Through Phonics is a 4-volume set of music CDs and visuals designed to reinforce the vital phonics knowledge that students need to become independent readers and writers. Through a variety of catchy folksongs, the entire scope and sequence of phonics skills are set to music, systematically arranged into four stages of phonics depth. The series begins at the pre-school/kindergarten level with Ready-to-Read for phonemic awareness skills like rhyming and alliteration. Volume 1 helps the kindergarten and 1st grade students with letter identification, letter/sound correspondence, simple rules, and early words. Volume 2 is aimed at 1st and 2nd grade, focusing on building a repertoire of common spelling patterns in multi-syllable words. Volume 3 reinforces 2nd and 3rd grade concepts such as letter/sound variants, homophones, more advanced spelling rules, word roots, prefixes, and suffixes. Sing Your Way Through Phonics audio CDs contain lively tunes that help students learn and remember important phonics concepts and rules. Songs are easy to learn because they are set to the music of time-honored folk melodies, with upbeat rhythms and whimsical lyrics. In addition, song lyrics contain examples for every phonics rule so that students are repeatedly applying the important reading and spelling principles to new sets of words. To provide additional practice in applying phonics concepts, each CD contains instrumental tracks where students can think of their own examples to substitute for the ones in the original songs. To be effective, these audio CDs need to be paired with visuals that help students see the crucial link to print. Sing Your Way Through Phonics CDs and Mini-Chart visuals are included in all Combos and Ensembles. The Ready-to-Read CD is only available in teacher voice. The Volume 1, 2, and 3 CDs are available in either teacher’s voice or children’s voices. For a small additional cost, both voices may be included in all Combos and Ensembles, supplying more variety for your students by alternating CDs. Sing Your Way Through Phonics Mini-Charts focus on the target words, letters, spelling patterns, and phonics rules addressed in each audio CD song. With print large enough to be seen from a distance on 8.5" x 11" pages, Mini-Charts visuals can be displayed on chalkboard ledges, easels, and music stands. As each song is sung, teacher or students point to the target words or letters as they occur in the song. All Mini-Charts include reproducible templates for substituting other examples for every song's target words or letters. 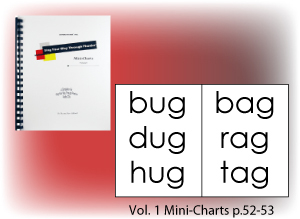 For example, to replace the words bug, dug, and hug in the song Spelling Families, students can use mug, rug, and tug. To view how Mini-Charts are used in phonics instruction, visit our Lesson Plans pages. All Sing Your Way Through Phonics Combos and Ensembles include over 100 pages of Mini-Charts. 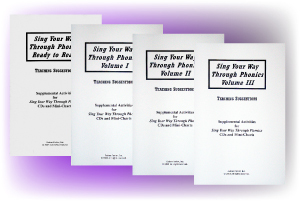 Sing Your Way Through Phonics Teaching Suggestions Booklets contain a basic lesson plan for teaching all the songs and specific suggestions for before, during, and after each individual song. With clear learning objectives for each phonics concept, these booklets suggest ways to vary song practice to maintain interest and motivation. For every song, at least one set of additional examples for the target lesson are included. These examples can be used when students sing with the instrumental tracks of the audio CDs. Other teaching suggestions include links to literature, phonics game suggestions, and movements that can be performed with the songs. All Sing Your Way Through Phonics Combos and Ensembles include Teaching Suggestions Booklets. Sing Your Way Through Phonics Song Lyrics Booklets display the words to each of the songs on reproducible 8.5" x 11" pages. Target words and spelling patterns used on the Mini-Charts are printed in bold. For large group viewing, Song Lyrics are also available in sets of overhead transparencies. Sing Your Way Through Phonics Song Lyrics Booklets are included in all Combos, in the Three Volume Classroom Ensemble, and in the Four Volume Classroom Ensemble Complete. For a small additional cost, Sing Your Way Through Phonics Song Lyrics are available in an overhead transparency format for the Classroom Ensembles. Sing Your Way Through Phonics Read-and-Sing Books are designed to complement Sing Your Way Through Phonics Volume 1 in a format that is suitable for listening centers and for individual listeners. In the back of every book is an audio CD with the song on two tracks - vocal plus instrumental and instrumental only. When students have learned all the words to the song, they can follow along in the book and sing using the instrumental track. 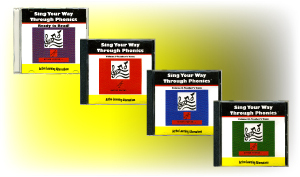 Each book is built around a single song from Sing Your Way Through Phonics Volume 1. Illustrated as humorous stories, the books contain adventures of Amos the Ape, Eli the Emu, Ivy the Irish Setter, Otis the Opossum, Uri the Unicorn, and Yvette the Yellowjacket (named for vowels a, e, i, o, u, and y). Several teaching suggestions are included at the back of each book. Sing Your Way Through Phonics Read-and-Sing Books are included in three cost-saving collections: Letters and Sounds (6 books/6 CDs), Early Words (5 books/5 CDs), and Read-and-Sing Collection Complete (11 books/11CDs). Individual Read-and-Sing Books are also sold separately. Sing Your Way Through Phonics can offer a unique chance for music educators to become part of their school’s literacy team. By “partnering up” with primary grade teachers, music teachers are in the enviable position of bringing the element of fun into what might normally be dull phonics skill and drill. Snappy folk tunes help teachers harness the power of music to help students develop phonic knowledge to the point of automaticitya necessary pre-requisite to reading comprehension. Children grow in both reading and writing skills with a solid foundation of phonics. Pre-school and primary grade students respond so enthusiastically to Sing Your Way Through Phonics that they actually look forward to phonics practice. Music is a powerful toolwhy not make it your teaching ally?